A Purchase Plus Improvements Mortgage, allows qualified purchasers to borrow up to 20% of the post renovation value of a home, even with as little as 5% down. Here's the five easy steps for the home of your dreams. 1. Obtain a mortgage pre-approval to determine your maximum approval amount. 2. You must find a house and have a general idea of what renovations need to be done as well as the cost of the renovations. The purchase price plus the renovation cost cannot exceed your maximum approval amount. 3. Once your offer is accepted, provide the accepted offer, as well as the quotes for the work to be done to me. I will have the lender approve the mortgage with the cost of the renovations included in the mortgage. 4. 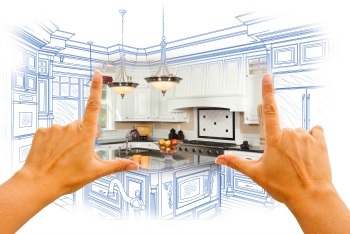 Once you take possession of your home, you can begin the renovations. The Lender will instruct the Solicitor to hold the additional Renovation funds, until the lender confirms the works has been completed. Once the renovations are completed let me know so I can arrange an inspection to verify the work is completed as per the quotes that were provided. 5. The lender will receive the inspection report from the appraiser, and validate that the work has been completed in a good manner and as per the quotes provided. They will instruct the lawyer that they are able to release the funds to you, to pay the contractor.